I have been looking for the perfect foundation for a long time, one which would give me light to full coverage with a natural healthy finish and also feel that you are not wearing makeup. 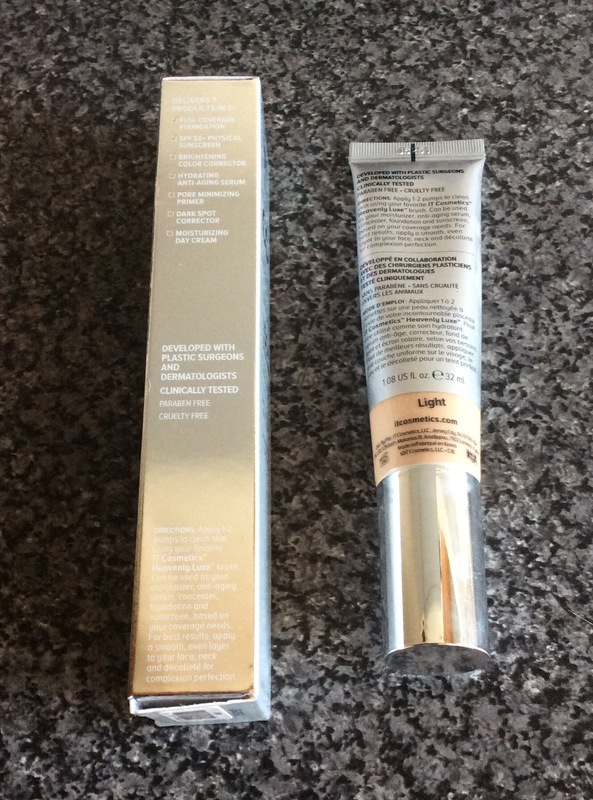 Therefore when I seen that IT Cosmetics had a Full Coverage Your Skin But Better CC cream with SPF 50+ which claimed to be both a full coverage cream + anti aging hydrating serum and seen that QVC UK were selling it with a heavenly skin brush for £31.92 I decided to purchase as excellent value and great way to try. The CC Cream is available in choice of colours; Fair, Light, Medium, Tan and Rich, so I ordered the Light option as seemed the nearest to my skin tone. A revolutionary brush featuring patent-pending, skincare-infused brush hair for flawless-looking skin and makeup. A Skin Perfecting Brush to help you create the perfect canvas. 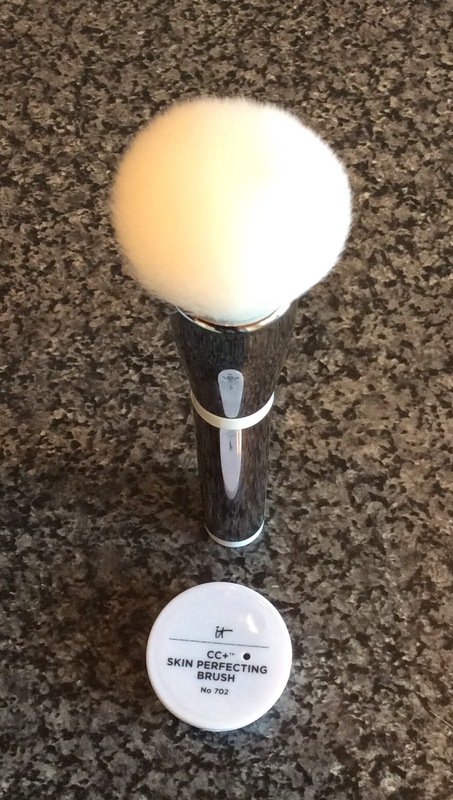 Love this brush, which comes in a clear cylinder container, the sleek silver handle with white bristles is so stylist and the bristles although v soft are still firm enough to apply foundation, blusher, bronzer or contour. You can see finger marks on the handle but very easy to wipe clean. A multi-tasking cream which aims to provide full coverage, protect your skin with SPF50+, as well as moisturise. Can be used as your moisturiser, anti aging serum, concealer, foundation and sunscreen based on your coverage needs. Also states is paraben and cruelty free and enriched with hydrolysed collagen, peptides, niacin, hyaluronic acid and vitamins A, B, C and E, plus chemical-free SPF50+. Love the sleek silver packaging. The CC+ Cream comes in a silver and clear squeezeable tube with a pump applicator. I prefer a tube and I personally feel that the pump applicator makes it more hygienic than a screw top bottle. The pump applicator is so easy to use and the CC Cream has a creamy consistency with a v light not overpowering fragrance. 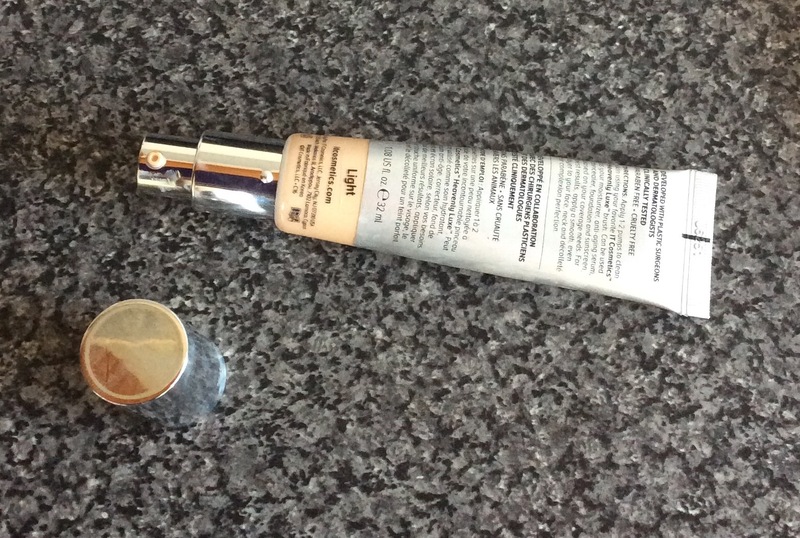 I used one pump and buffed it into my skin with the brush, it applied v easily, give me a lovely dewy (not greasy) natural finish with good coverage, also felt it was moisturising my skin at the same time, not heavy at all, does not settle into any fine lines either and ‘Light’ was the correct choice for me. If you prefer a heavier coverage you can use two pumps but it is buildable so would recommend starting with one pump (advises applying 1-2 pumps to clean skin). Although I do like the finish I get with the brush I have used the CC+ cream with a beauty blender and my fingertips as well, sometimes I think I get an even better finish this way. However I still love the brush, and also use it for contouring, as well as for applying bronzer, powder, blusher. I absolutely love this CC Cream which is so, so much more, provides moisture, excellent coverage, which is also buildable depending on the coverage you want, has SPF 50+ and feels like you are not wearing makeup, which I love. I definitely agree can be used as a concealer as well on areas where you want more coverage (however I still prefer using a light concealer on these areas as well), also leaves your skin feeling hydrated, looking healthy with a natural radiant glow and skin feels smooth to the touch. I also find it does last well throughout the day as well. I will be repurchasing and I would definitely recommend trying. As QVC have a 30 day return policy, if you find it not suitable for you and you return your product within this time period you will get a full refund so definitely a great way to try this product to see if it is suitable for you as well. As not many UK retailers stock it at the minute (although I think I have seen advertised previously that Selfridges should be stocking the brand from June 2017), I have included details of the QVC UK offer below but note ‘Light’ is now only available by signing up to their waiting list. 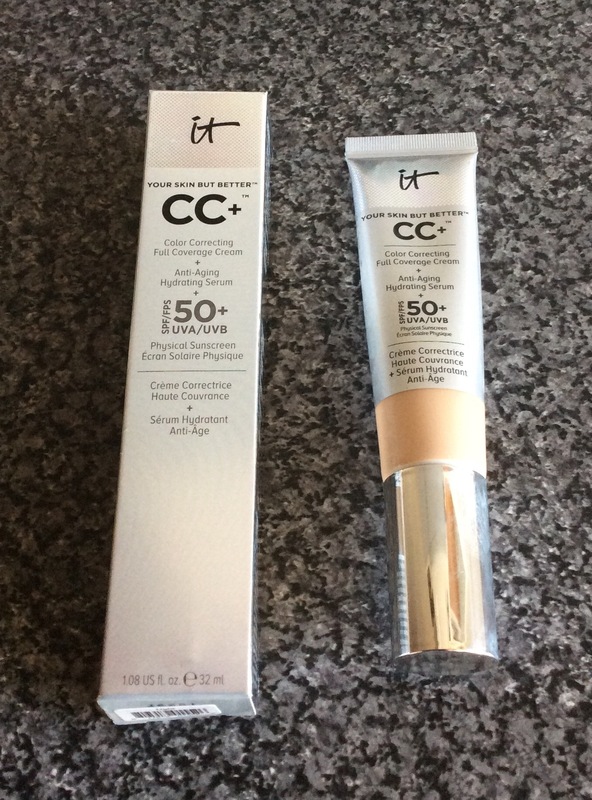 Look forward to any comments you may have – have you tried this CC+ cream already, if so, do you like it as much as me? If you are not already a follower would love you to follow my blog too – would mean a lot.